Just wanted to show that your Pokemon disassembly project inspired me to try to do something similar. I have decided to try disassembling Links Awakening DX down to readable source. As of right now I have been working on bank 0, it compiles but the labels aren't complete yet so changing any code that could set the call and jumps off. Some item handling stuff has been labeled as well. 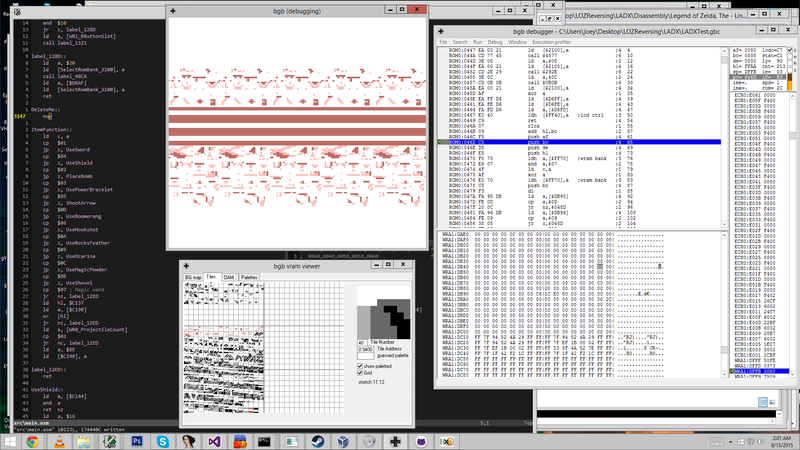 I ended up writing a half assed disassembler so I had something that rgbdis could compile. Perhaps someone could direct me to a good disassembler. Haven't tested this but the first bank may be fully compilable to the point where code can be moved around and changed. I added some stuff to my disassembler to hopefully improve disassembly quality. The disassembly will have to get very close to done before you can shift stuff around (especially in the home bank) because every other bank is full of static pointers to things in the home bank. These pointers break when you add a nop, like you have done. At the time of doing that I completely forgot about that. I was way too optimistic thinking I could do that. Ah well, time to continue on.